Self-catering Cottage with 5 bedrooms and 3 bathrooms. Sleeps 10. Saturday changeover. Self-catering Gîte with 14 bedrooms and 8 bathrooms. Sleeps 28. Saturday changeover. Self-catering Gîte with 21 bedrooms and 21 bathrooms. Sleeps 48. Non-applicable changeover. Self-catering Gîte with 10 bedrooms and 5 bathrooms. Sleeps 20. Non-applicable changeover. Self-catering Gîte with 7 bedrooms and 7 bathrooms. Sleeps 14. Non-applicable changeover. Self-catering Gîte with 12 bedrooms and 8 bathrooms. Sleeps 20. Non-applicable changeover. Self-catering Gîte with 14 bedrooms and 10 bathrooms. Sleeps 30. Non-applicable changeover. Self-catering Gîte with 5 bedrooms and 2 bathrooms. Sleeps 10. Saturday changeover. Bed and Breakfast Auberge with 1 bedrooms and 1 bathrooms. Sleeps 4. Non-applicable changeover. If Paris is the capital of France then Burgundy (Bourgogne) is its heart. The region lies midway between the vast cereal plains of northern France and the valley of the Rhone and the south. The River Yonne is the traditional waterway to Paris, the Loire marks the western border and the Saone flows through the southern vineyards. In many ways the landscape reflects the Burgundian character; hospitable and friendly, expansive, tinged with nostalgia, dignified and religious but tempered by an irrepressible spirit and a wit as sharp as mustard. Its colourful history has marked the region with a rich heritage of Romanesque architecture that stands as a testament to the mediaeval stonemasons, woodcarvers, sculptors and painters of the time. The great abbeys of Vezelay, Potigny, and Fontenay, the Gothic cathedrals of Auxerre and Nevers, resting place of St. Bernadette of Lourdes and the basilica of Paray-le-Monial, famous as a centre of pilgrimage. Wine has shaped Burgundy's way of life for centuries and its wine making tradition goes back to the monks of Cluny and Citeaux. Chablis, in the Yonne is the first of the great Burgundy whites and the Auxerrois wine route curves and winds through mediaeval villages surrounded by their vines, with whole communities devoted to its production. The countryside of the Cote d'Or is marked by an endless patchwork of carefully tended vines, each producing an appellation known around the world. There are celebrations throughout the year but the high point of the yearly cycle comes after the vendage, with three days of feasting, tasting, and auctions. These are held at l'Hotel Dieu in Beaune, a magnificent building, built as a hospice for the sick and needy in 1443. Its jewel coloured tile roof echos others throughout the region. You can follow the Route des Vins and sample and buy. Southern Burgundy is still wine country and Tournus makes an ideal base for visiting the Chalonnais and Maconnais vineyards and exploring. To the west is rich wooded farmland, the fields dotted with white Charolais cattle, mellow villages, fort farms, and 'air so pure you only have to breathe to get fat'. To the east are the flat plains of the Bresse, which produces chicken so fine that they have been awarded their own appellation as a mark of distinction. Louhans in particular has a very good market every Monday and many small brasseries where you can lunch. The Morvan runs through the centre of Burgundy and is a vast nature reserve with lakes and forest. It is a haven of great beauty, space and silence where you can walk and fish, ride, cycle and hang-glide. There are few towns but you are never far away from a village. It is well signposted with almost empty roads. 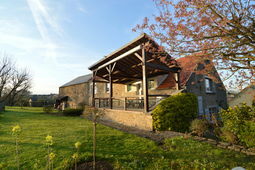 Hotels and gites are generally small but full of character and there are excellent restaurants providing local cuisine. Good markets throughout the region, although the days vary. Many excellent Michelin starred restaurants at Joigny, Vezelay, Saulieu, Chagny and elsewhere. Family owned auberges deep in the country often serve superb regional dishes for modest prices. Go to Epoisses, famous for its cheese, which can be bought at the fromagerie where it is made, or sample at the local café with a glass of wine. Dijon means mustard and pain d'epices. Don't miss the pastries and chocolate. There are many museums to choose from and most charge a small entrance fee. In the summer there are numerous fairs, fetes, carnivals, concerts, theatre and pageants throughout the region. Good shopping in larger towns, food shops, and bakers open early, other shops open later at 9 a.m. and sometimes not until after 10 a.m. In town centres, almost everything closes for lunch at noon until 2.30 p.m. and sometimes after 3.00 p.m. after which they open until 7 p.m. Most shops are closed all day on Sunday and Monday. Other activities include: boating, windsurfing, ballooning, cycling, mountain biking, riding, golf, hang-gliding and fishing. From spring until late September and sometimes beyond, the climate is warm and dry with summer temperatures often reaching 30 degrees C plus, occasionally punctuated by short heavy thunderstorms. Cooler mornings and evenings in early spring and late autumn.